I read another thread titled ' stretchmarks on face' " and one guy on there is saying he's been getting these indents in his skin after dermarolling. Heres my question I personally have never heard of this before especially it being related to rolling, I'm wondering if this is a common thing and if it is is it permanent or do they go away? I've only rolled my face once and there hasn't been any issues thus far but if there's a chance that dermarolling causes this effect I will not be rolling again, because I'm not about to trade one problem in for another. Any insight on this Sarah? I was the person making that thread. I still don't know what's wrong with me and I didn't do anything prior to dermarolling so it may either have been the dermaroller or the vitA-oitment that triggered something I dont know. It wasn't the very first time I rolled so it can't have been that or the ointment alone, I have other healthissues these days so I don't know. I did use the ointment at daytime after rolling maybe that was a mistake? I've seen two dermatologists now (saw second one today). I still have problems with my skin feeling like it's burning and stuff after 3 months. I haven't gotten more intendations however I think I'm not sure htough, it looks just as bad as it did after rolling. I also lost parts of my beard after that roll(?) but that came back after a month or so. Just to clarify. The other person writing there (a woman) got a diagnosis I guess, I haven't checked in cause I don't want to get bad anxiety from reading stuff... But if this doesn't get better soon I'll have no choice I guess. If I don't apply anything at all whatsoever my skin looks ok sort-of but I can't apply anything (like any cream/ointment/oil) or my skin feels irritated and burnish. Same with being in the sun it feels like it's burning. But again I think as long as you start off safely by for example rolling a smaller area without too much force, then using more force the next time etc. there shouldn't be a problem. And even if there were any problem the chances of getting whatever I'm suffering with is probably almost 0, I'm just one really really really really unlucky guy. Talk about a horror story. Good to know it was not the derma roller. Anna, have you tried a non-acid form of vitamin C for topical use such as magnesium ascorbyl phosphate (Dermalogica Chroma White TRx Extreme C) or sodium ascorbyl phosphate (emerginC forte 20% vitamin C serum) or tetrahexldecyl ascorbate (SkinMedica Vitamin C + E Complex )? Just some suggestion for you to look up and consider! I know vitamin C serums are so expensive. But if you want the cheapest one I know made by a well known company (as of now) is Paula's Choice RESIST Super Antioxidant Concentrate (it has 5% tetrahexyldecyl ascorbate). i think you will better benefit from toppical non acidic vitamin C because of the direct contact and absorption you get. Plus, I heard that vitamin C helps with inflammatiion and even out skin tone. It may be of value for you to make your ultra sensitive skin look calmer. You know Anna, there are other antioxidant serums without vitamin C that you can also get benefits. Some people just aren't lucky with acidic stuff or vitamin C in general. Skin Organics has the Super Berry ORAC-6000 - Antioxidant Serum that is loaded with antioxidants. If have no grudge against drugstore brand, I think you should go consider Olay Regenerist Daily Regeneratng Serum, Fragrance Free. It has Matrixyl, Vitamin B3, and green tea. If you live in the US, and you are near a target, they sell a bottle for less than 20 dollars. OR you can buy cheap on amazon.com. Your choice! Free shipping on amazon. So sorry for getting off topic on this thread. Lol. Anna, I feel like you have such difficult skin! No offense, of course. Do you have rocasea? Have you tried hydrocortisone cream to deal with the redness? If you love organic skin care, there are two websites I know that specifically sell so call "organic and natural" products. They are Skin Bontanica & Apothica. Mind you a lot of the products are costy (at least to me). Topical L-ascorbic acid: percutaneous absorption studies. I have just finished reading the whole study. What an interesting study!!! If Yorkshire Pig skin is appropriate and comparable to human skin in regards to epidermal and dermal layers and their permeability and available enzymes and such. Any draw back? I need to find information of the anatomy of the pig skin. Is there a human study on l-ascorbic acid absorption? The paper was caution in mentioning which studies tested on animal or human skin, which I think is helpful for the reader to be aware of. What does it mean when the scientist wrote “Apparently the molecule must be un-ionized for precutaneous absorption to occur”? How can we determine that, say in DIY formulation? Does that got to do with hard water or soft water (minerals in water, right)? I think there are some people who cannot tolerate low pH vitamin C product, thus, they venture into more stabilized non acidic forms. Just an assumption, but I think stabilized form of vitamin C do offer antioxidant benefits and collagen product and all that jazz, just doesn't absorb into skin as well as l-ascorbic acid. It has to do with ascorbic acid breaking down into positively and negatively charged parts. The higher the pH the more ionized it is. For our purpose it means that the pH of vit. C preparations has to be kept below 3.5 for the best absorption. 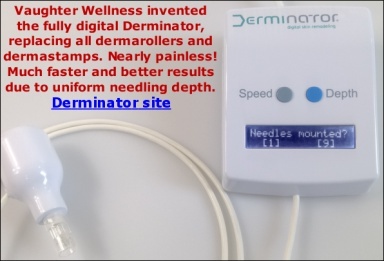 You can use a dermaroller for product penetrating enhancement (short needles) to enhance the absorption of vit.C but if you apply it right after dermarolling, it will sting because it is acidic. If you apply it after dermarolling, add more water to vit. C serum to make it weaker. The question about a comparison of pig skin with human skin is a good one but I do not know yet the answer. I suppose that the fact these studies are made with pig skin suggests that they must be similar in relevant characteristics.